Description: A photo of NS 5613 moving cars around to assemble the circus train. 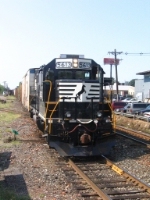 Description: A close-up of NS 5613. Description: NS 5613 on the Northern Branch leaving Croxton Yard. Description: With a wave from the conductor, NS HC90 brings the RBB&B train to North Elizabeth station to clear Lane Interlocking. Description: As Amtrak pulls the circus train away, NS HC90 now starts its journey back to Croxton. Description: NS H90 starts to roll out of Croxton yard after the switching frenzy. Description: This is the Siding South of Wood Ridge Station in the Pascack Line. Description: Traffic on the Lehigh Line came to a halt as this Air Products extra went east. Description: The 2007 Ringling Brothers circus red train pulls up the the remains of New County Road before proceeding with switching out the coaches. Description: The NS H81 pulls the red unit of the Ringling Brothers and Barnum & Bailey Circus train onto the Long Siding of the Pascack Valley Line. Description: A view of the 2007 Ringling Brothers and Barnum & Bailey Circus Red Train from the NS 5611. Description: Despite the sun and blue skies, it was a very frigid day. The NS H81 crosses Union Avenue on the Long Siding as they pull up to spot the cars for unloading. Description: The NS H81 pulls the circus train up the Long Siding as a track machine moves around. Description: Circus train crossing Union Avenue. Description: The NS H81 brings the Ringling Brothers and Barnum & Bailey Circus train up the Long Siding on the Pascack Valley Line. Description: The NS H81 pulls the circus train up the Long Siding to spot up the equipment cars and stock cars for unloading. Description: A Ringling Brothers and Barnum & Bailey Circus elephant stands next to the circus train. Description: Elephants are unloaded from the train as a truck pulls up to take away two of the elephants. Description: Not the best angle due to where the sun is, but the circus train readies to depart NS tracks at the ex-NJT Harmon Cove station. Description: After setting off the flatcars, the NS crew comes to a brief stop, checking their clearance as they pass a parked NJT flatcar. Description: Not the best angle due to where the sun is, but here is the train at the former NJT Harmon Cove station as it awaits clearance onto NJT. Description: After dropping off the flatcars, NS is ready to bring the remaining cars toward their destination. Description: A wider view of the circus train. It was due to NJT's track work in this area that the cars were not parked here. Description: The animal cars are put into position to allow them to be unloaded. Description: The NS crew tie down the train so the animals can get ready to be moved on a bitterly cold winter day. Description: A closer look at NS GP38-2 5613. Description: A New Jersey Transit westbound races beside the NS H80 at Pascack Junction. Description: Eastbound light engines have a clear signal at CP Tara. Description: Metuchen Road, 1756 hours. Description: The NS HC20 emerges from the ex-Erie Bergen Tunnel.